The best thing about birthdays is obviously the cake. 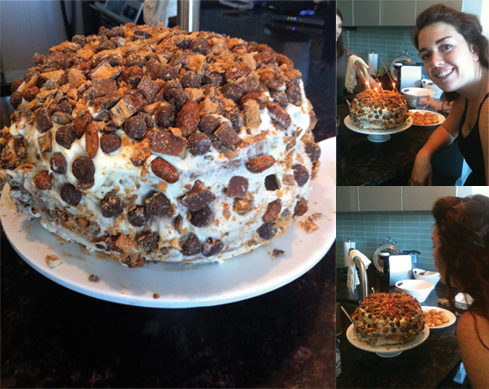 Last year, my friends made the most amazing Peanut Butter Butterfinger Cake. It was unbelievably decadent and, seeing as I was a college student, I may have made it my main course for the day a few too many times. This year, I faced a dilemma. My two favorite traditional cakes are Red Velvet and Carrot. I would place myself in the indecisive person category. The time I spent mulling over this decision is probably more than the average person. However, I have to say I’m very happy with my choice. If you thought I rationalized the Raspberry Streusel Bars, Carrot Cake takes my dessert justification to a whole new level. The amount of vegetable oil and carrots in this recipe clearly count for at least two servings of vegetables, right? The calories are totally worth it. 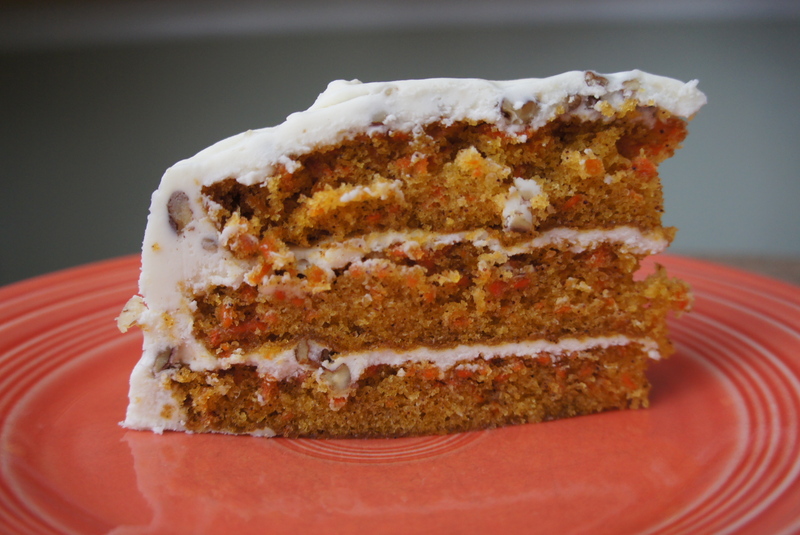 This is my all-time favorite carrot cake recipe. It’s the moistest I’ve run across and the cream cheese frosting sprinkled with pecans is heavenly. Also, the only seasoning it uses is cinnamon which adds the traditional spice but leaves plenty of room for the carrot flavor to shine. My birthday is complete. Preheat oven to 350 degrees. Combine first 7 ingredients; stir in eggs, oil, and vanilla, mixing well. Spoon batter into 3 greased and floured 9-inch round cake pans. Bake for 30 minutes or until a toothpick inserted in center comes out clean. Cream first 4 ingredients until well blended; stir in pecans. Spread frosting between layers and on top of cake once it’s cool. Traditional Red Velvet which does not include cream cheese frosting: but a frosting made from sugar and shortening, very traditional from 50 years ago, I understand.